Apple’s upcoming iPhone 8 is unlikely to have a curved edge display despite rampant speculation that the new device may adopt the design with its organic light-emitting diode panels having a flexible nature. Since the Cupertino-based iPhone maker for the first time decided to use OLED panels for its new flagship smartphone, there has been speculation that the device may sport an edge display like Galaxy S8 offers. Samsung adopted the edge-to-edge display -- where two sides of the device are curved edges -- for all Galaxy S8 series despite some complaints from consumers who accidentally touch the edge screen. “Apple is highly unlikely to follow the same design of its rival’s. Instead of the curved edge display, it will have a flat screen with bezel-less on the top and bottom alongside the two sides,” a source familiar with the matter told The Korea Herald. As to why Apple adopted plastic OLED even though it will not make the device curved or with an edge, the source said, OLED can make the device thinner and lighter compared to liquid crystal display panels that Apple has long adopted for its former iPhone models. Apple will reportedly delay the release of iPhone 8 as it solely relies on its rival Samsung for OLED panels. Samsung Display, which is only capable of mass producing OLED panels for smartphones, is currently having a hard time to meet demand outstripping supply. “Apple may unveil its iPhone 8 in September, but it is predicted to go on sale in October or November,” said Taipei-based KGI Securities analyst Ming-chi Kuo, who is famous for his iPhone-related predictions. 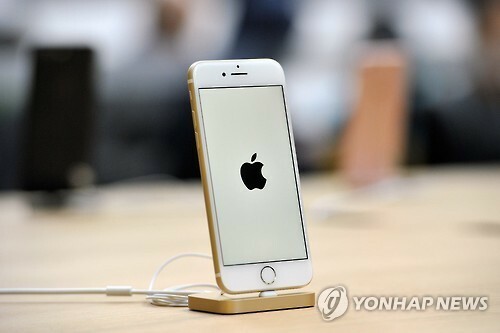 Kuo said only about 2 million to 4 million units of iPhones will be available in the third quarter of this year due to the shortage issue. Apart from OLED panels, iPhone 8 is also predicted to sport several new features such as advanced facial recognition scanner and 3-D sensors supporting augmented reality applications. The new facial recognition scanner with 3-D sensors can deeply sense a user’s face in the millionths of a second. Also, 3-D sensors are said to be adopted for the front and rear of the device to realize AR applications, which integrate 3-D virtual images with user’s environment in real time. Apple and Samsung tried to have an in-display fingerprint reader for their new phones, iPhone 8 and Galaxy Note 8, respectively but both of them appear to have failed to put the scanner under the display screen due to technical difficulties.